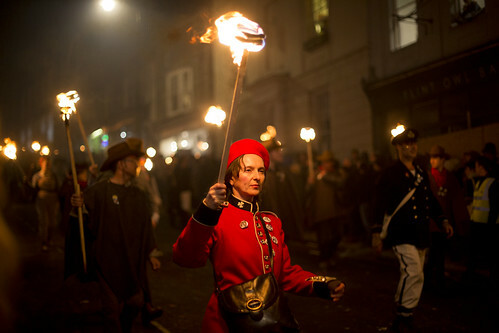 Every year, a tradition which goes back to the mid-sixteenth century continues to this day in and around the Sussex and Kent regions where processions of people take to the streets to celebrate Bonfire Night. Six Bonfire Societies congregate in the small town of Lewes in defiance of the impact that political/royal factions had on the people back in the reign of Henry Tudor and his family. Bonfire societies originally formed in protest of the torture and deaths of some of the local people who just wanted to follow their chosen religion in peace with one another and yet, Queen Mary 1st had other ideas. Martin Luther was a Priest and German professor of Theology and he was intrinsic in the reformation. Despite being a priest, he completely refuted the churches right to offer indulgencies which were essentially get out of jail free offers for the Catholic’s in higher society who paid their way into heaven and out of trouble, particularly given that two of the recent popes had both had children out of wedlock (and given that they should be celibate, it’s not a good start!). Luther did not support this stance, being of the belief that the Pope was never given the right to offer pardons on this earth or in heaven/purgatory – that would remain gods holy ordinance. Despite all the religious ramifications, Henry stood his ground and made the decision to divorce Catherine of Aragon and go on to create the Church of England which in turn would have its own bible (which was written in English so that the common man could enjoy the writings as it was thought that the common folk could not read Latin) of course, this doctrine was brought into effect when there was no such thing as a printing press and every bible or document had to be handwritten. It was strange to think that the general populace simply accepted what they were told about the writings in the bible and were unable to challenge it as Martin Luther pointed out that he had never seen a full copy of the bible for himself. As someone who was brought up a devout Catholic, when her father decided to become the ruling religious power in the UK, following on from the teachings of Martin Luther (not the black activist from the US) things changed dramatically for Mary. Henry VIII daughter by his first wife Catherine of Aragon continued to follow her Catholicism and despite his several marriages he had two daughters; Mary and Elizabeth before Jane Seymour produced a boy; Edward VI. On Henry’s death, the succession automatically passed to Edward aged just 9 but he was a sickly child and never actually took over the reigns as he died aged just 15 but before his death, he tried to stop Mary returning to the throne as he believed that the country should remain Protestant – to this she was quoted as saying that she would rather lay her head on the block (for beheading purposes) than forsake her faith. He put his cousin, Lady Jane Grey to the throne but Mary managed to oust her in just 9 days and she followed this by riding into London on horseback alongside her sister and over 800 noblemen to take it back. Lady Jane and the first Duke of Northumberland, Lord Dudley were both taken to the tower before being beheaded – adding more to Mary’s list of victims. Following her death in 1558, her half sister Elizabeth took the throne and reigned for the next 45 years in relative peace and without the need to change religion yet again. Today, the people of Lewes use the opportunity to gather as a community in support of their own and remain part of something which has gone on for literally hundreds of years after the failure of the Gunpowder Plot in 1605 and the Marian Persecutions of the middle of the 1500’s. They do it with a certain amount of ‘tongue in cheek’ particularly when poking fun at the politics of the day. This year for example, crowds of tens of thousands were in attendance to see Boris Johnson holding an axe in his left hand and the head of Theresa May in the other. There was a cacophony of jeers amongst the gathered crowds calling for Boris to be thrown onto the pyre. The Sussex Bonfire Societies are not the only ones who were using good old Boris as the centre for fun as Edenbridge Bonfire Society burnt an effigy of him at their event on Saturday 3rd November. In this case it was a 36-foot tall effigy of Boris holding an EU cake with mis-matched socks, a cycle helmet and slippers with the caption ‘Having your cake and eating it’. There was also a bit of a dig at the train timetable related issues which massively impacted on the area in the Summer as the Lewes Ghost Train highlighted their experiences with re-scheduling, missing stations off routes and last-minute cancellations of services. The one thing which causes more ooohhs and aaahhhs than anything else are the flaming tar barrels which were said to have been used to fumigate homes and to indicate the arrival of the Spanish Armada. 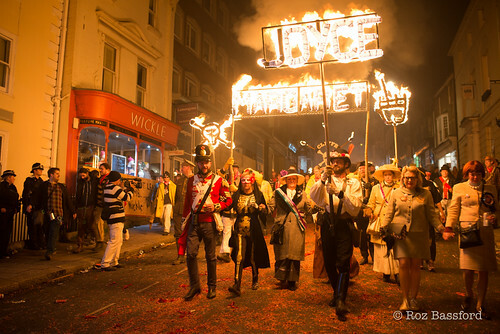 The Lewes Bonfire event brings together the community in a fascinating way and also brings in 30,000 spectators to witness first-hand the amount of effort which goes into creating the parade, the effigies, costumes and of course the beautiful fireworks at the end of the procession. The Lewes Bonfire is the biggest of them all and has always been held on the 5th. This year once again they were supported by other local societies including Waterloo. South Street, Southover, Commercial Square and Cliffe Bonfire Societies. The streets were packed with people holding flaming torches aloft dragging flaming tar barrels and each have their own bonfire set up at the end of their parade. Unlike ANY other event in the UK it continues to show support for residents who have lost their lives from the martyrs of the 16th century to the men and women fighting to keep our shores safe at home so I think that political correctness has gone mad and this is one of the few ways left open to show your despair at the state of the country and the impact on local communities.